Wrecking ball is the hottest new inflatable game on the market today! 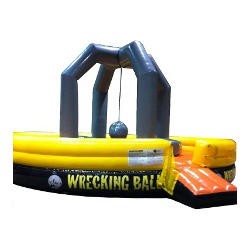 Our new Wrecking Ball inflatable is the perfect interactive challenge! Four opponents climb aboard their pedestals in an attempt to keep their balance while swinging and dodging the inflatable boulder! The last man standing wins. A great sports inflatable game! Have you ever seen a wrecking ball and not smiled? Me neither. Now you can't knock down your least favorite school class room with this. I know all the English teachers are breathing a sigh of relief. But you can get in the arena with your teachers and try to knock them down. (I'm betting on the teachers). Seriously though, the Wrecking Ball inflatable wants to do damage at your next event. You can put a total of four happy people on the wrecking ball at one time and let them swing the might wrecking ball at each other as they try to balance on an inflated pillow. This inflatable game is relatively new to the market. Make sure you rent it for your next event. It's a ton of fun. Accommodating four participants at once, this Wrecking Ball interactive inflatable keeps everyone engaged in the fun. All participating kids get to wear the latest in stylish protective foam head gear, so there’s another reason to rent the Wrecking Ball. The Wrecking Ball itself is made of a heavy foam. Yeah, I know. We were disappointed too. Evidently solid steel is too dangerous according to the manufacturer. After we tried it out though, we quickly realized that it was probably more fun that way. The Wrecking Ball is one of the newest interactive inflatables on the market. It’s just another reason to love us over here at Game Craze. We’re always trying to make your party or event more fun than it was the last time.